With over two centuries spent serving the educational needs of the pupils who come through our doors, we’ve created an environment where young minds can thrive. We don’t consider our offering unique simply because we’ve been operating for such a long time. 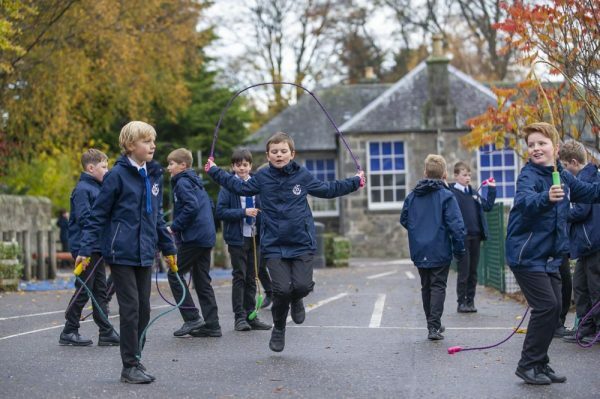 The 200 years we’ve been in existence has, however, given us ample time to build a first rate learning environment that makes us one of Scotland’s largest and best performing independent schools. At Dollar, the focus is on positive encouragement of individual talents, interests and ambitions. It’s this approach and well-rounded culture that drives the ever-impressive performance of our pupils. After all, a happy child makes a better student than an unhappy one. This simple fact is why the enjoyment of learning is so important here. A high quality education is about far more than our academic reputation. It’s about enabling pupils to step up to the mark and helping them achieve not only in the classroom but beyond it too. Dollar benefits from a picturesque setting in wide green spaces at the foot of the Ochil Hills, yet lies within easy reach of major cities in Central Scotland. Edinburgh and Glasgow, with their international airports, rail and road links, are less than an hour away. We cannot tell where we will be in one year, let alone one hundred. What I do know is that the impact of Dollar, the lessons we have learned here, will stay with us – just as they have for every pupil over the last 200 years. We are a community founded on the pursuit of knowledge and a belief in the power of education. Our ethos of “work hard, be kind and get involved” is firmly rooted in every student and member of staff at Dollar. Vibrant, talented and always welcoming, all individuals at Dollar Academy work to create a positive atmosphere where our core values of “excellence, opportunity and community” will thrive. Read more about some of the staff that make up our community here. It’s important you have all the right information at your fingertips when you’re making any decision- including fees, boarding houses, community, and FAQs. Get in touch with us if you require a tour or have any questions. Want to learn more about what Dollar Academy has to offer? Our admissions process welcomes people of all backgrounds and you can be sure of fair consideration for your child’s place here. Our main goal is for pupils to leave us with a lifelong love of learning. It’s something we believe will serve any individual well, whatever their ventures may be in life after school. Dollar Academy, its campus and the people who live work and learn here is really something that’s best experienced in person. Explore the campus in person now.